Aqua Creek has developed another innovative and versatile lift designed for use on BOTH in ground and above ground pools and spas! This innovative new lift takes many of the features customers have been requesting the most: a versatile lift that can be adapted to most pools and also can accommodate heavier patrons! That's right; the NEW REVOLUTION™ actually has a weight capacity of 500 lbs (227 kg)!! That is 100 lbs (45 kg) more than the standard weight capacity of most of the lifts on the market today! With the addition of the Revolution™ to Aqua Creek's product offerings there really is no reason to go to any other manufacturer for all your aquatic lift needs. 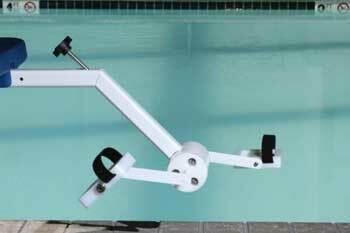 The Cycle Attachment is an upgrade that makes exercising in your pool trouble-free and convenient. The Cycle Attachment quickly converts your Revolution Lift into an aqua therapy bike. Simply slide the Cycle Attachment into place, lower yourself down into the water and enjoy hydro-therapy without ever leaving your lift! Easily adjustable to increase or decrease resistance as you feel comfortable. 500 lbs (227 kg) weight capacity! A full 360 powered rotation in either direction! Ships via common carrier @ 315 lbs. No other lift offers such versatility; come and join the REVOLUTION!